Davies & Associates is proud to assist Kuwait citizens and residents with their global immigration needs. Our team offers the full range of investor immigration services, from filing successful visa applications to providing corporate and tax services. We help our Kuwaiti clients move their businesses, their families and themselves to the United States, as well as a range of countries around the world. We are a leading law firm at supporting individuals, families and businesses across the Middle East with immigrant visas to the United States. The main investor visa options for Kuwaiti nationals seeking to enter the United States are the EB-5 visa and the L-1 visa. While there can never be guarantees in immigration cases, Davies & Associates has never had an EB-5 or L-1 visa application rejected in our many years of experience. Kuwait nationals who are able to invest $500,000 in the U.S. economy are eligible for a green card under the EB-5 program. This investment is made into a government-approved “Regional Center”, which uses the money to fund a project, often in real estate, to support and sustain ten American jobs. There are over 800 Regional Centers across the United States, and D&A works closely with clients to select the best one to meet their needs and interests. The L1 visa program allows Kuwait-based companies operating in the United States of America to bring skilled workers at the executive or managerial levels from overseas into the country. The visa is granted for different lengths of time to different nations. Kuwaitis are eligible for the maximum 5-year duration, during this time D&A is able to work with clients to find longer-term immigrant visa solutions. The L1 visa also allows for owners of small businesses to expand their business in the United States and transfer an executive member of staff to the United States to manage that business. D&A is a full-service law firm that offers our clients support in all aspects of moving their business overseas. Our tax and corporate teams help our clients prepare business plans that meet stringent US Citizenship and Immigration Services criteria, as well as with filing tax returns, which can be a complicated process. D&A has a market-leading India practice group that is able to offer special services for Indians resident in Kuwait. This includes support with EB-5 Visas and with citizenship by investment in Grenada coupled with an E-2 visa to the United States. Our Pakistan practice group is able to offer specialist support to Pakistanis resident in Kuwait. Pakistanis are eligible for a number of different visas for the United States including the EB-5 Visa, the L-1 visa, the E-1 Treaty Trader and the E-2 Investor Visas. Our team will work with you to explore the best option for your circumstances. Our Egypt practice group, based in Cairo, is able to give additional support to Egyptian citizens living in Kuwait. We are a market leader in supporting Egyptian citizens with attaining EB-5 visas. Egypt is also an E-2 Treaty countries to the United States and we are able to assist Egypt Citizens with acquiring this and other visas. Although Kuwaiti Citizens are not currently eligible for E-2 Investor Visas to the United States, D&A is able to recommend solutions for those wishing to pursue this route. This can include first attaining citizenship of Grenada in the Caribbean. 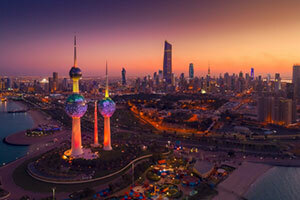 Residents Kuwait may be eligible for E-2 visas depending on their country of citizenship. Nationals of Egypt and Pakistan are eligible for E-2 visas, but nationals of India are not. D&A has supported a number of Indian clients with Grenadian citizenship coupled with an E-2 visa. Thanks to our truly global footprint, D&A is able to support citizens of Kuwait with a range of Citizenship by Investment schemes, this includes schemes in the European Union and in the Caribbean. We are a market leader in the Citizenship by Investment in Grenada program and work with a range of other global citizenship by investment schemes, including Cyprus and Malta.